It's not often that you'll come across a vehicle that checks all the boxes of features that make a great vehicle. Performance and utility make a vehicle handy, but when you add in luxury you create a great all-around driving experience. The BMW X5 is crafted to be the embodiment of these three things combined. Tackling the streets in the BMW is a new adventure every time. There are so many features to discover. Powering this amazing vehicle is two dynamic powertrains. If you prefer more versatility, then you have the option of the X5 xDrive40i that comes in six-cylinders and 335 HP. If you want a bit more power, then you have the option of the X5 xDrive50i that comes with eight-cylinders and tops out at 456 HP. If you require cargo space, then the X5 has you covered. 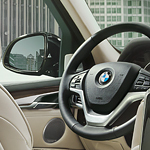 The X5 has up to 72.3 cubic space to address your cargo needs. To make loading up easier, the X5 also comes equipped with a power split tailgate.